A story of race and friendship is not a foreign concept in filmmaking, specifically those that involve the relationship between an African American individual and a white individual in the face of glaring racism or danger of some sort. Set it in any time period you like, they’re still designed with a message in mind, to move the narrative forward and widen perspectives or make people feel better about themselves and their own prejudices. Green Book wants to be the former, but undercuts itself so much, it becomes the latter. Dr. Don Shirley (Mahershala Ali) is a world-class African-American pianist who’s about to embark on a concert tour in the Deep South in 1962. In need of a driver and protection, Shirley recruits Tony Lip (Viggo Mortensen), a tough-talking bouncer from an Italian-American neighborhood in the Bronx. Despite their differences, the two men soon develop an unexpected bond while confronting racism and danger in an era of segregation. For a film like Green Book to even remotely work, the performances from the two leads have to connect, and getting Mortensen and Ali is a good first step. Both men are some of the better actors working in Hollywood today and this film doesn’t change that in any way. They both bring emotional depth to their characters, a necessity for a film that relies so heavily on a lighter tone, preventing it from becoming a trite endeavor. Mortensen gives a big, over the top performance complete with stereotypical Italian mannerisms. His knack for nuance elevates a character that lacks any self-reflection within the confines of the script. On the other side is Ali, a poised and dignified musician that strives to maintain a sense of order and self-control in a place that hates him makes for a truly fascinating performance. The few moments where the walls of Ali’s Doctor Shirley exterior break down make for some of the best parts of the film and will earn the actor a place in the awards conversation. However, the outright praise for the film ends at the performances, as a shaky script bogs down what could’ve been a much better film. 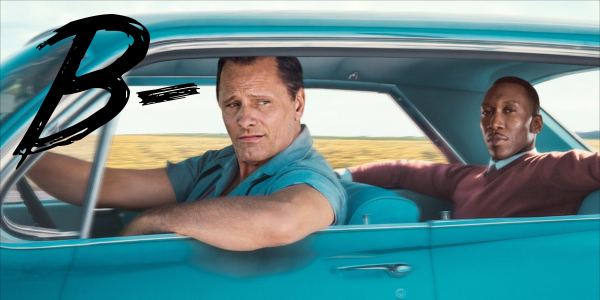 Choosing the topic of race relations or racism shouldn’t be done lightly, and in an age of turmoil such as 2018, it much be treated with subtlety and nuance that Green Book just can’t muster. The film is Tony’s story, for better or worse, and uses the horrible actions towards Dr. Shirley as a tool to teach this particular New Yorker a lesson and allow for him to heroically step in time after time while his own racist views are never really addressed. For all intents and purposes, Tony is meant to be the savior of this film, a strong-armed protector in the deep south that’s never forced to examine his own beliefs, thus rendering the any moral intentions of the film irrelevant. Green Book is a frustrating film more than anything else. The pieces are there for a great film, including two great performances with natural chemistry and some genuinely funny moments littered amongst the lesser than script. It is a well put together film from almost every angle, capturing the look and feel of the time period wonderfully, however, it stumbles where it needed to succeed the most, with a softened script designed for the masses. Green Book feels dated already despite being released publicly only a few short weeks ago, and lacks the real punch that such a story requires.